The orphan boy-calf Teros relied on his terrible visage and instinct for sudden violence to survive on the streets of Dragonport. He got by as a stone carrier and debt collector until, in the gladiator pits, he found his true calling in reckless combat. He thrived in the ring, crushing cleverer foes with implacable fury and animal wile. In the end, he could only be pitted against the rare ogre or giant, and he moved on to a life of wandering. For a time, he carved out a place in Fangwild Forest, shouldering aside a wyvern and a hobgoblin clan. Later, he fell in with the Iron Legion, turning the tide of the Battle of Orc Pass for the Zombie Lord. His tenure as wizard’s henchman ended typically – with the evil mage shrieking to him, “Finish Them!” while fleeing through a magic portal. He lived for a while deep in Peril Mountain, where he found a strange comfort in the maze of abandoned tunnels. 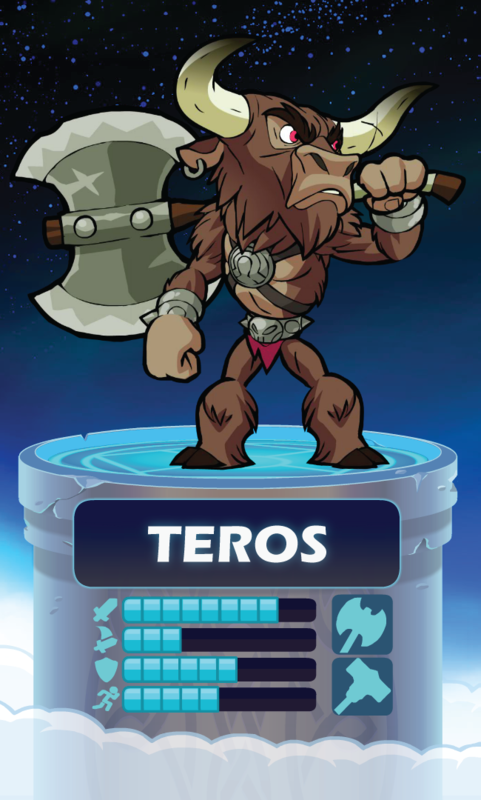 In Valhalla, Teros is indifferent to the rules or intent of the Tournament, but takes savage joy in all battle. His nightly visit to the mead hall is heralded by throngs of fleeing Valhallans.